For Hong Kong, what is deemed “local” is a multi-layered historical experience shared by generations of immigrants and emigrants. Each of these layers has given the place unique cultural characteristics. The talk urges us to uncover and cherish these global footprints. They have provided the resources for Hong Kongers to connect with extensive overseas communities, to capture unusual opportunities, and sail through political storms. What will be the strategic steps to take as Hong Kongers face an assertive China and an uncertain global future? Helen F. Siu is a professor of Anthropology and former chair of the Council on East Asian Studies at Yale University. She grew up in Hong Kong and attended Carleton College and Stanford University. Prof. Siu has conducted decades of fieldwork in South China, exploring agrarian change, the nature of the socialist state, and the refashioning of identities. Lately, she has become interested in rural-urban interface in China, inter-Asian connections, and China-Africa encounters. Prof. Siu has served in numerous funding and research assessment committees in the United States, Europe, and Asia, and she was the founding director of the Hong Kong Institute for the Humanities and Social Sciences at the University of Hong Kong, which is devoted to cross-disciplinary research and global collaborations. Her recent publications include Asia Inside Out (2 volumes; Harvard University Press, 2015); Tracing China: A Forty-Year Ethnographic Journey (Hong Kong University Press, 2016); and “China-Africa Encounters: Historical Legacies and Contemporary Realities,” Annual Review of Anthropology 46 (November 2017). 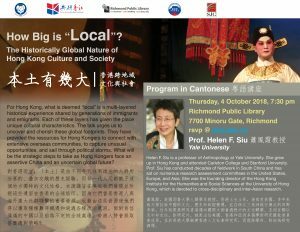 This community conversation is organized by the UBC Hong Kong Studies Initiative and co-sponsored by the UBC Department of Asian Studies, Richmond Public Library, and the Vancouver Hong Kong Forum Society. Prof. Helen Siu will also be the Speaker of the 2018–2019 Yip So Man Wat Memorial Lecture. Please kindly visit the web site of the UBC Department of Asian Studies to register for that event.